Think outside the fruit mix-ins! Here are some Greek yogurt recipes and ideas you might not have thought of. Some foods are so flexible and multi-purpose they're perfect to keep on hand every day. But "staple" is almost too small a word for the amazing versatility that is Greek yogurt. For starters, there's the creamy texture and rich taste. Greek yogurt is also a pre- and postnatal nutrition slam dunk: The low-fat variety clocks in at 170 calories, 23 grams of protein and a whopping 25% of most women's daily calcium requirements for one cup. Plus, Greek yogurt has a fairly long shelf life, and can be used in recipes both sweet and savory. 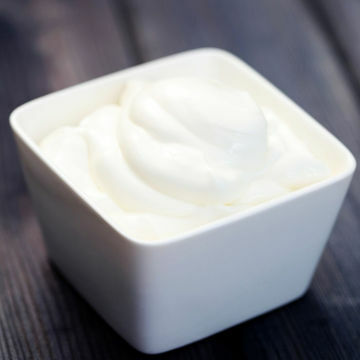 In chilled dishes, for instance, Greek yogurt makes a simple swap for higher-calorie and higher-fat ingredients like mayonnaise and sour cream. It also seems to magically melt into hot dishes to give them a rich texture and creamy finish in lieu of butter or cream. You can use Greek yogurt in everything from dips and salads to soups and sides. I stick with plain, low-fat (2%) Greek Yogurt for the most satisfying flavor. I use it so often in recipes I write and dishes I make at home that I'd list it as one of my best healthy-cooking "secret weapons." If it's not in your fridge at the moment, pick up a container to try in some of the easy cooking ideas below or in my recipe for Greek Tzatziki Sauce. You may find it becomes one of your healthy-eating secret weapons, too! Puree a little bit in to give a rich creamy texture and mouth feel; it's also a great flavor booster if your avocados aren't fully ripe. You'll be able to use less butter and cream yet still achieve silky delicious results. I've used it in everything from celery root puree to cauliflower and potato gratins. And, yes, it's amazing in mashed potatoes. Use in place of ½ or all of the heavy cream in creamy soups; just whisk in at the end of cook time. It works in everything from Cream of Broccoli soup to Butternut Squash Bisque. Alternatively you can swirl it into Indian Curries or use it as a cooling topper for Spicy Chilis. A favorite snack or easy breakfast, layer your Greek yogurt with fresh fruit, chopped nuts, or granola for crunch. My girls like to sweeten theirs up with honey or vanilla flavoring syrup. You can also stir in a little all-fruit jam to make your own lower-sugar fruit-flavored yogurt. Keep a variety of frozen and fresh fruit on hand for easy smoothie-snack making. Just toss your favorite fruit in the blender with a little juice and some Greek yogurt for a super-rich and creamy smoothie. Use as a replacement for sour cream in any salad dressing of dip or in creamy sauces.